Posted on Tue, Feb 28, 2012 : 5:55 a.m. If you're looking for a cat companion that prefers one-on-one attention with her special person, Merry Merry might be the perfect pet for you. 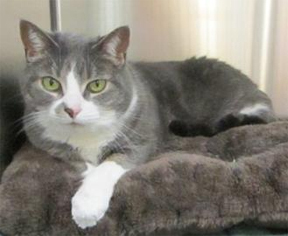 This lovely 8-year-old, gray and white short-haired cat has been bounced around through no fault of her own. Her last home had eight other cats, and Merry Merry was not too happy trying to vie for affection. Maybe you've heard that cats don't like change. In fact most cats need time to adjust to new situations and, for some felines, that can take a bit longer, especially when they have had no consistency. When Merry Merry first came to the Humane Society of Huron Valley, she was sad and very nervous and we can't blame her. We gave her the time she needed to feel safe, and now we see that she is an affectionate and chatty little girl. She likes to vocalize and tell you all about her day, and she loves to be petted too. She wants to be your only pet, and, in return, she will give you unconditional love. Right now you can adopt Merry Merry for only $20 during the HSHV "Winter Warmers" adult cat adoption special. Deb Kern is the marketing director at HSHV.